My husband had been diagnosed with hypoglycemia. The worsest thing is that he has been suffering from panic attack since he pasted out at the work 3 years ago. I was too silly that I hadn't tried to use 100% whole wheat flour on my recipe. 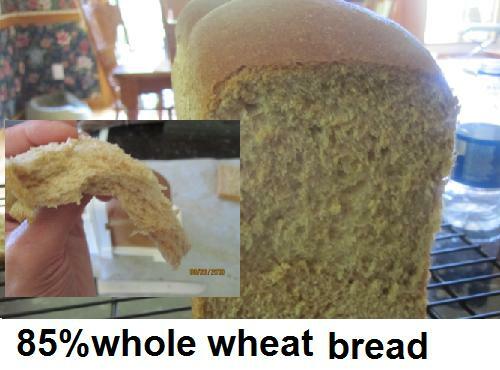 ( My old recipe was 54%(Actually 54.5%)whole wheat bread) And yet he likes 55% whole wheat bread more than than 85% or 100%. (23cm x 10.5cm x 10.5cm) 100% -13cm height and 85% -13-14cm height and 55%- 13-14cm height after baking. Note: When you proof the dough too much before baking, You will have really tall bread, but the top part will be really light. To warm up :10seconds in a microwave using normal mode. To soften :20 seconds in a microwave using defrost mode. #I always use all purpose flour. 1. Put * ingredients in order except *the flour in a big bowl and mix. Add *the flour and mix. Set aside. 2. LEFT: Put whole wheat flour and salt in a midium bowl. Right: set the butter in a small bowl. Top: No.1. 3. Put the flour and salt mixture in the food processor and hit pulse 5.6 times until combine. 4. Add *dough mixture and the butter run until combine about 40 seconds or so. 5. Take the dough out from the food processor, and clean *dough mixture bowl. Put the dough back in the food processor and run until combine. 6. Time to knead by hand for 15 minutes. Push it down and stretch and fold and repeat over and over. 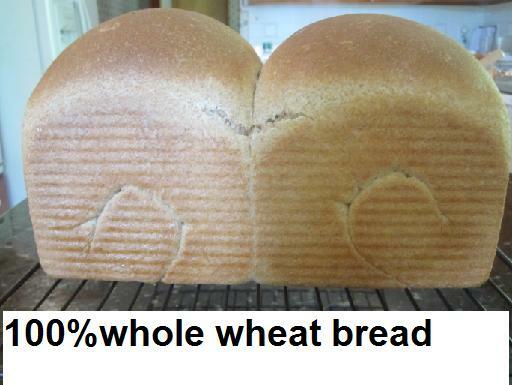 This is very important to get strong gluten development. 7. Put some shortening on a large bowl, and place the dough in. Proof at 28℃　or 32F for 50 minutes or until the loaf double in size. 9. Shape : Both oval's height should be around 20cm. * pinch very well! : My way: to have taller loaf. Rolling on the second process. Take a look below. 11.Pace the dough have equal space in the pan. 12. Proof at 38℃ or 100F until the dough rises up a little over the top of the pan. 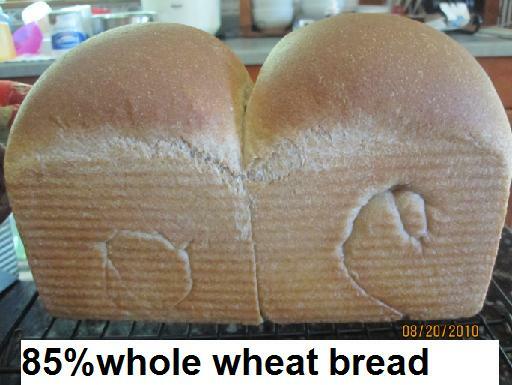 ( around 1.2 hours for 100% whole wheat bread and 1hour for 85% whole wheat bread) * The time is vary depends on the temprature. 13.Preheat the oven to 200℃ or 400F. Decrease 180℃ or 350F and bake for 30 minutes. How much egg yolk? How much cream? And exactly what does one do to it(them)? I see you did something similar to the butter. Is the idea here of bringing these colder items to room temperature? Thank you for telling me the point, mrfrost. That was totally unclear. 2 egg yolk (L size) + Heavy whipping cream =80g in total. To warm up : 10 seconds in a microwave using normal mode. >I see you did something similar to the butter. Is the idea here of bringing these colder items to room temperature? A nice pictoral overview of the process, and thanks for including the rolling methods used. The Japanese bakery method looks virtually identical to that used for shaping baguettes. But I like your variation on it! I just wanted to have taller one as like Japanese bakers make. I couldn't get reach up to the height without using Japanese flour. I think some of them have higher protain than others. Threre is another way to shape sandwich when you use a pan with lid. You can see the method. Cllick the site below, This is Japanese but you can see how to shape because there are lots of picturs on the process. Hope that your husband's blood glucose is stable now. Your bread is impressive, personally I'm not so fond of soft bread, but I'm sure it tastes good. It's good to see you have started your own blog here too. I am looking forward to seeing your posts on it. He is stable when he eats right meal in the right time. That scares me a lot. I checked this recipe that you told me too. The problem is a budget. 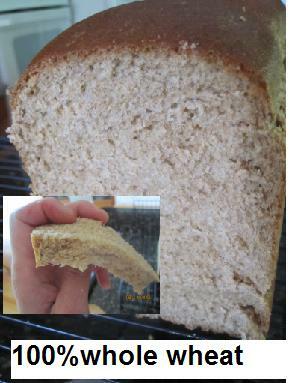 It was very airly bread when I used Cheap dry milk. We spend $110 a week for food which means including condiments too. That is very hard. I don't buy instant noodles, I make mayonnaise,many kind of special Japanese sauce and so on from scratch. I will try to make a starter soon :) really!! Tomato pretzel with tomato yeast water and the thin pocky and crackers.